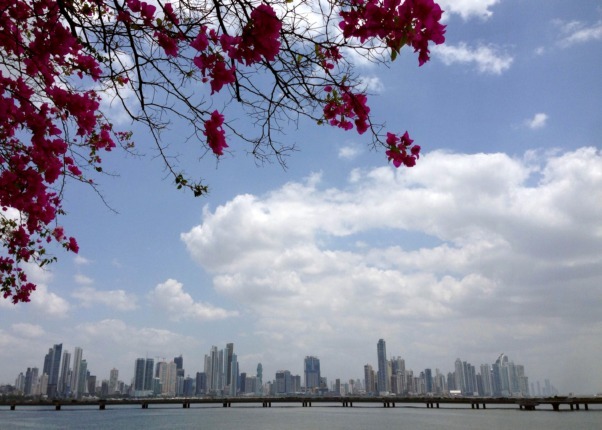 Panama City has amazing landscapes, world-class tourist attractions and tons of culture. 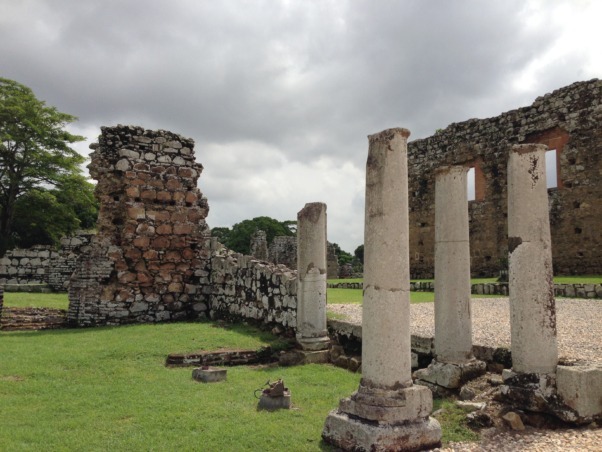 The first thing that pops into your mind when you hear Panama is probably the Panama Canal, but there are also the beautiful white-sand beaches and turquoise Caribbean waters of the San Blas Islands, indigenous cultures, tropical highlands with world’s best coffee, and the vibrant nightlife of Panama City. Yes, all of these are tourist attractions in Panama! Although the capital, Panama City, is a world class tourist destination, most people don’t know what to expect when they arrive. Not to worry: we’ve got your back. 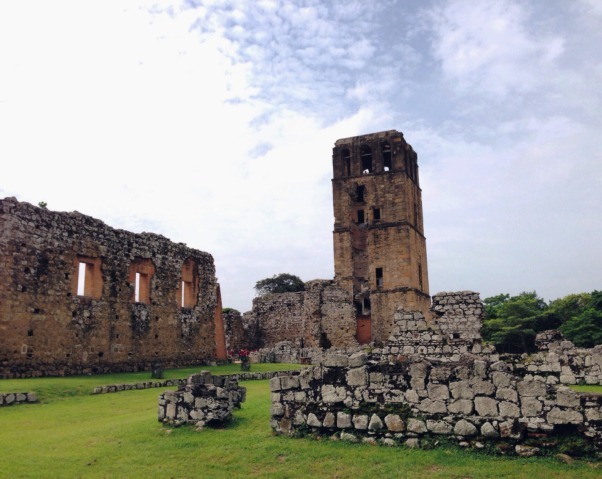 Here are 7 amazing Panama City attractions that should not be missed! This little spit of land in the former Panama Canal Zone connects Panama City to four islands at the Pacific entrance of the Panama Canal. With water on both sides – the Panama Canal on one and the Bay of Panama on the other – you can watch ships enter and exit the canal up close and also take it amazing views of the Panama City skyline. Rent a bike or walk along the path to Flamenco Island at the end and reward yourself with an ice cream or cold beer. It takes about an hour to bike to the end and back from the BioMuseo / Bicicletas Moises though we recommend taking 2 so you have time to search for Sloths on Isla Culebra or grab a bite to eat at Cayucos across from the Flamenco Marina. Your visit: Visit late afternoon around 4 or 5pm and rent a bicycle at the start of the Causeway – Bicicletas Moises (directly next to to Pencas restaurant rents bikes for $3.75/hour). Wear comfortable shoes and bring some water with you. Insider Tip: Head to the Smithsonian run Punta Culebra Visitor Center on Isla Culebra to see wild 3-toed sloths. They are easier to stop inside the visitor center though they can also sometimes be spotted along the fence. Ask the security guard at the entrance to point out the “perezosos”. 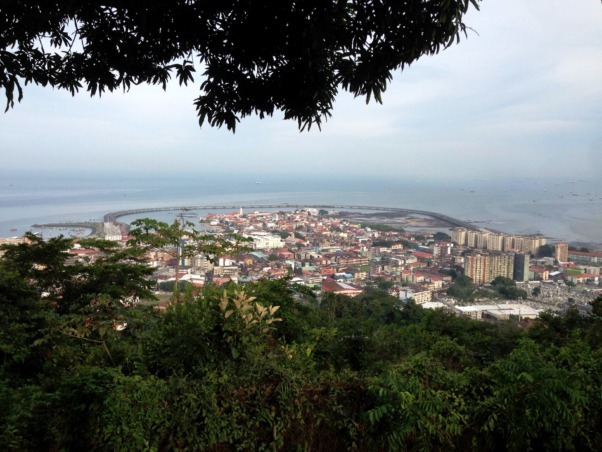 The Ancon Hill – or Cerro Ancón – is the highest point in Panama City. The 654-foot hill was under American jurisdiction until 1977 when it was returned to Panama. Ever since, it’s held the Panamanian flag up there, a symbol of pride that can be seen from almost every corner of the city. 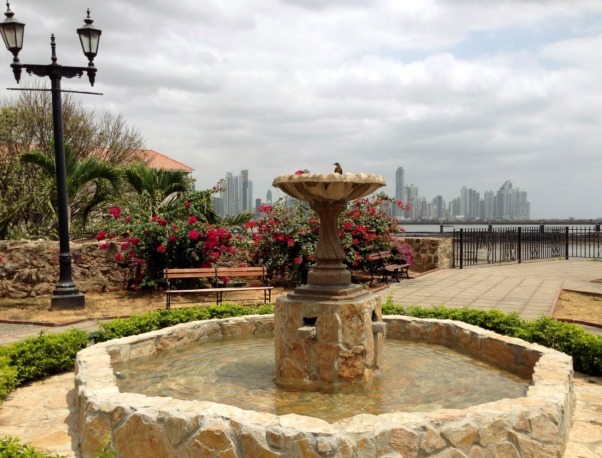 The Ancon Hill is another excellent exercise point in Panama City and you’ll see lots of locals doing just that. 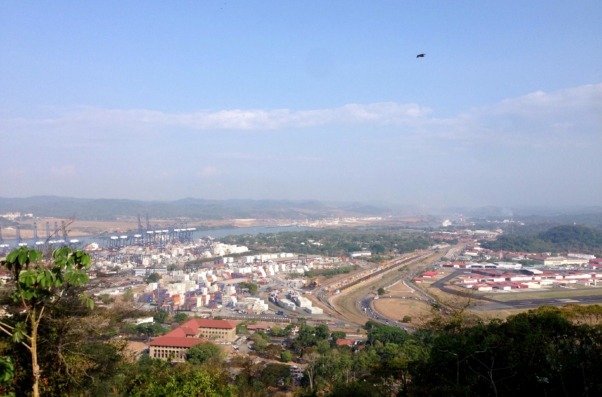 But this Panama activity is totally worth it: from the top of the hill you get the most amazing view of the city, from the port to the Panama Canal. The climb is easy to moderate, but be prepared for hot and humid weather. Your visit: Come very early in the morning for birdwatching and the possibility other surprises, like toucans, sloths, frogs, monkeys and the ubiquitous ñeques, an adorable mammal in the rodent family. Don’t forget to wear comfortable shoes and bring some water with you. We recommend you take an Uber to the security gate or “garita” and walk the 20 minutes from there to the top, though for those who prefer not you walk you can drive all the way to the top. Insider Tip: The security gate closes to cars at 4pm daily, though Ancon Hill never closes to pedestrians, runners, and bikers. The best time to visit is early in the morning or around 5pm if you’d like to see more animals and avoid the midday heat. 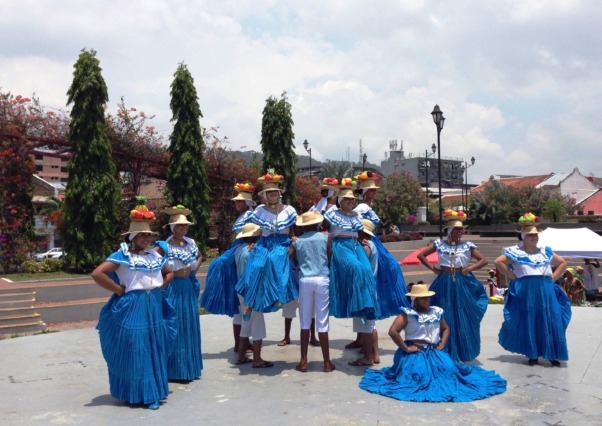 The most visited tourist attraction in Panama surely does deserve your attention. 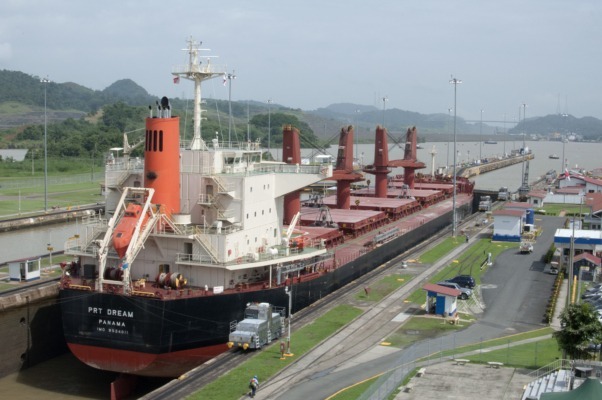 The Panama Canal is not only an amazing civil construction, it’s a gigantic connection between Atlantic and Pacific oceans that changed modern trade completely. It’s hard to know what to expect from this Panama tourist spot, but the visit is super fun and the touristic structure is really cool, so it’s totally worth it. 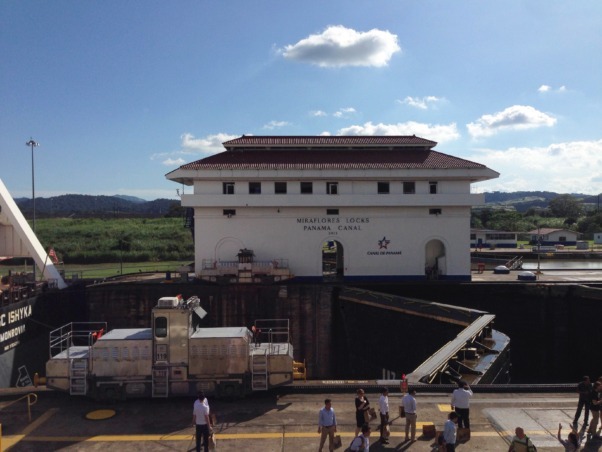 Your visit: Plan your visit early-mornings or mid-afternoons, because one of the 40 ships that do the 10-hour route through the Panama Canal everyday are supposed to be on Miraflores Locks from 9:00-10:00 am and 2:30-4:00 pm. The best place to watch the ships is at the observation deck on the 3rd floor, but at the 1st floor, in front of the ice cream shop, you can see all the action in a way less crowded space. After that, make sure you visit the museum, which has different information on all 4 floors, and finish your visit catching the movie on the 1st floor to learn more about the history of the canal. Insider Tip: For those who want to visit The Panama Canal at night or up close without the crowds, make a reservation at the Atlantic & Pacific Co., the restaurant located on the second floor inside the Miraflores Visitor Center. 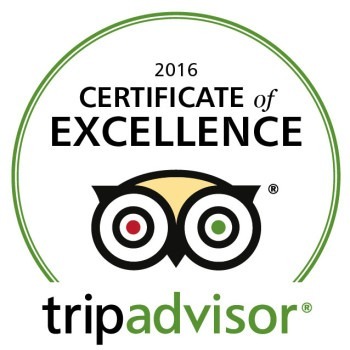 The food is excellent – gourmet Panamanian, we recommend a booking a table on the balcony well in advance and ordering the whole fried fish ($26). The view is literally one of kind with ships passing through the locks of the canal directly in front of you. There’s no entrance fee but plan on spending about about $50/person with tax, tip, and a drink. 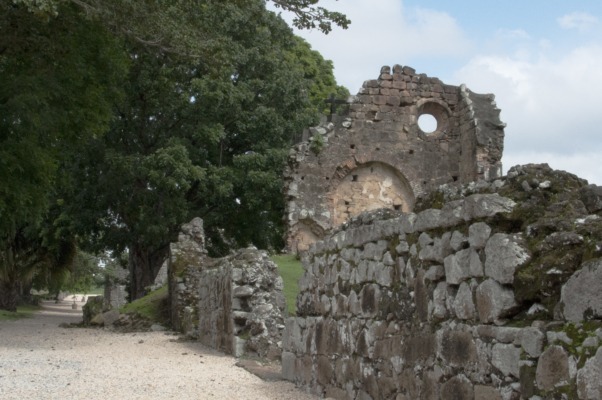 History lovers will specially love visiting Panamá Viejo – or “La Vieja” – the ruins of the original Panama City, the first one ever built by the Spanish at the American Pacific coast. It used to be a fisherman village that later attracted the pirates’ attention. In the year of 1671 the pirate Henry Morgan invaded the city, which was later abandoned. Now, you can walk around these old buildings and picture how live was almost 500 years ago! As far as tourist destinations in Panama go, this one is pretty interesting. Your visit: After you get the tickets you get two options: wait for their little train to take you to the end of the site and come back walking, or start your visit walking through the ruins and board their train on the way back. Either way, make sure to use the train: besides being handy in Panama’s hot weather, it also has some cool information. Make sure to go up the Tower, where you can enjoy a beautiful view of the contrast between the new and the old Panama City. During the visit, don’t forget to bring: comfortable shoes, sunscreen, sunglasses, bug spray and water – they don’t have a store there. Sunset bike ride on the Cinta Costera and around Casco! Great way to practise Spanish and meet some excellent people! Parallel to Avenida Balboa, the biggest and most famous avenue in Panama City, the Cinta Costera is an awesome space that runs along the coast from the middle of Panama City all the way around Casco Viejo and down to the Maracana soccer stadium. Half boardwalk and half urban park, this is one of the best places in the city to work out, exercise and enjoy the view. Locals and tourists go to Cinta Costera daily to run, ride bikes and skating. Besides these activities, there you’ll find sport courts, ping pong tables, playground (and also a climbing wall!) for kids and the famous “Panama” sign. The best part is the gorgeous Panama City view you get from there: in front of you you’ll see the modern skyscrapers in Punta Paitilla, but turn around and see the old churches and building in Casco Viejo. Your visit: Cinta Costera is great any day of the week, but it’s even more special during the weekends. Try to avoid this area between 11 am and 2 pm to prevent sunburns. Insider Tip: Best time to visit is early in the morning, 6-7am, or in the evenings from 6-10pm when the weather cools down and there’s a nice ocean breeze. It’s especially popular with local Panamanian families on Sunday afternoons and evenings when the area by the Mercado de Mariscos fills with street vendors selling shaved ice (raspao’), hotdogs, snacks, and toys and there’s lots of families enjoying their day off on the waterfront promenade. 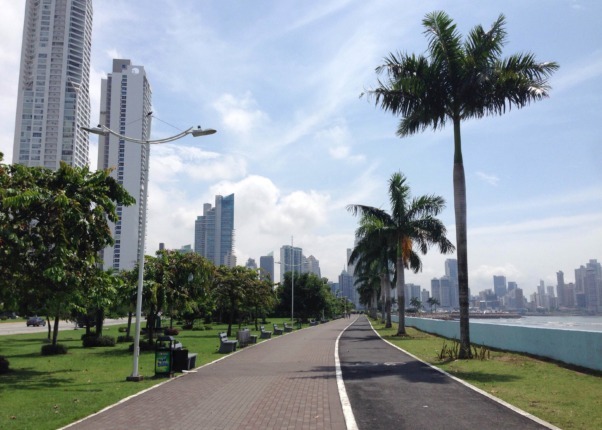 Students at Casco Antiguo Spanish School can enjoy our Free Sunset Bike Tour every Thursday along the elevated bike path of the Cinta Costera 2 which loops around Casco Viejo and offers incredible views of the old quarter and the Panama City skyline. Start the experience at the Biomuseo on the outside: this colorful plate-made building is the only piece of work from architect Frank Gehry in all Latin America. While visiting the museum you’ll learn more about animal and vegetal species in Panama and how this little strip of land that connected North and South America changed the Earth completely! Your visit: The visit to the Biomuseo shouldn’t take more than 1.5 to 2 hours. When you leave, it may be a good idea to rent a bike and enjoy the ocean view from Amador Causeway. Insider Tip: For those not wanting to shell out the $22/person, you can visit the outdoor exhibit on the ground floor below the museum for free, as well as peep the incredible architecture without paying the entrance by grabbing a coffee or empanada a the cafe inside the museum. We saved the best for last! 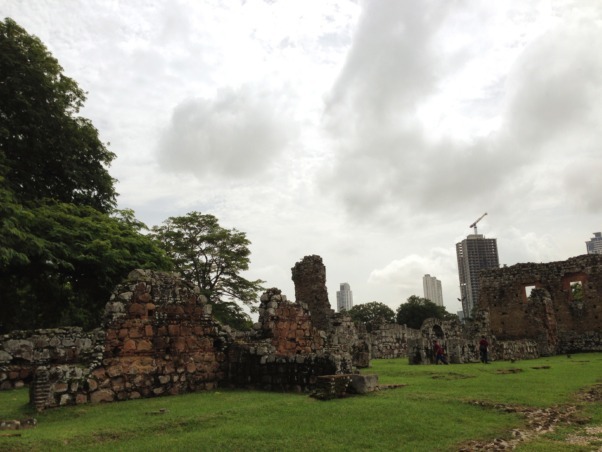 Casco Viejo – or Casco Antiguo – is the old neighborhood of Panama City and honestly, the best one! Casco has narrow streets, lots of pubs and restaurants, historic buildings, squares, art galleries, museums, a great city view and the best place to walk around in the whole city. It’s also considered a World Heritage by UNESCO since 1997. 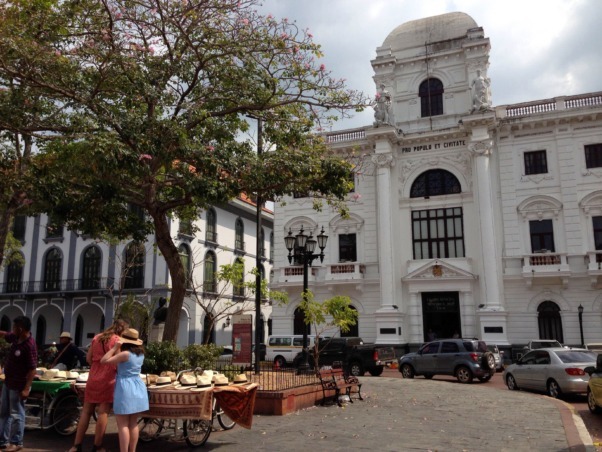 If you’re sightseeing in Panama, Casco Viejo definitely has to be on your list. Your visit: There are many popular attractions here: Plaza de Francia, Catedral Metropolitana, Iglesia de la Merced, Museu do Canal, Plaza Herrera, Mercado de Mariscos, etc. But the best part about Casco is to walk around aimlessly, enjoying its little corners, taking lots of pictures and maybe stoping for a great cup of coffee. And once you’re here, make sure to pay us a visit! Casco Antiguo Spanish School is located in Avenue A with Calle 4. Just send us a message and we’ll be glad to help you have an unforgettable time in Panama. Ready for an adventure of a lifetime in Panama City? This post appeared first on Blog Bus 142.